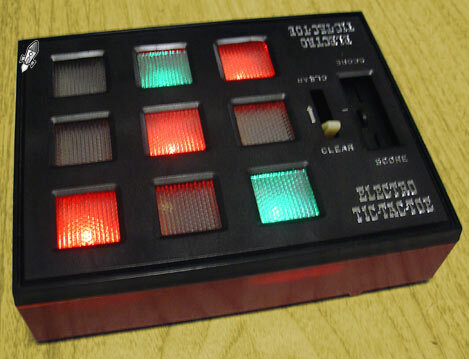 Retro Thing: Waco Electro Tic-Tac-Toe - First Electronic Game Ever? 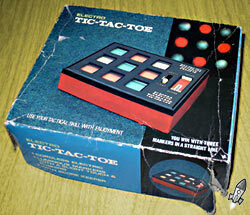 Waco Electro Tic-Tac-Toe - First Electronic Game Ever? Check out this little bit of gaming history. I was reading a website about handheld electronic games, and it mentioned that 1972's Electro Tic-Tac-Toe by Waco may be the first electronic game ever. 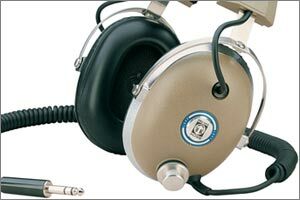 I found the same sort of info on other sites as well. Realizing that I have the actual game, I unearthed the old thing and started to play around with it. You need two players (forcing you to find a second player is a lot cheaper than Waco trying to develop complex A.I.). Using your fingers (does that count as "digital"?) you take turns sliding one of the nine little buttons on the game board. The tile lights up either red or green, and you play tic-tac-toe like normal. The box promises "cordless electric" - sure, it's battery powered. "Luminous markers with a slight touch & pushing"... uh, okay. "Use your tactical skill with enjoyment". Hmm, maybe we're not going to get many answers from the carton. Getting back to this game's place in the record books, I don't think that you can really call this game "electronic". To me an electronic game has to have calculations or logic going on inside its little brain. Beeps are also nice. Electro Tic-Tac-Toe operates entirely mechanically. Sliding the little tiles turns on a series of lamps (not LED's, mind you), and flips a filter either to red or green. That's it. No electronic scoring, no computer opponent, not even a beep. Waco brings us a clever little box of lights. 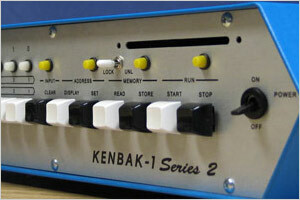 Definitely cool, but I think that we need to look elsewhere to find the first electronic game ever.